The citizens of New York City are a passionate, opinionated bunch. So, it is not a surprise that they reacted with outrage and ridicule when their new mayor, Bill de Blasio, was shown on TV eating pizza with a knife and fork. That’s right — a knife and fork. De Blasio went to a well-known Staten Island pizzeria for a sit-down meal, started strong by ordering a sausage and smoked mozzarella pie, and then botched it by carving up his slice with a knife and spearing each piece with a fork. New Yorkers went bonkers, and the media wondered aloud whether de Blasio had lost some of his street cred as a result. For a guy who has presented himself as a two-fisted fighter for the little guy, eating pizza with a knife and fork seems awfully . . . prissy. It’s the sort of thing your great-aunt Gertrude might do with a look of stern disapproval on her face. De Blasio defended his blunder by saying that in his “ancestral homeland” — his mother is Italian — people eat pizza with a knife and fork. Please! Everyone knows that pizza in its modern form is an American invention, and the American way of eating it is to grab a slice by hand and gobble it down. You end up with fingers that are covered in a greasy orange glaze, a mound of wadded napkins also stained orange, and a contented look on your face for having enjoyed the complete pizza experience. Eating pizza with a knife and fork is not only vaguely insulting, it also misses out on half the fun. Good Lord! Does de Blasio use a knife and fork to eat a New York dirty water hot dog, or a doughnut? Imagine a Chicago pol using utensils to eat a dripping Italian beef sandwich, or the mayor of the City of Brotherly Love using a fork to finish off a Philly cheesesteak, or Memphis’ mayor using a knife and fork to eat a mound of ribs. It’s unthinkable! We’ve already established that politicians should never be photographed eating a corn dog. De Blasio’s experience shows that they need to apply similar thoughtfulness when they sit down to enjoy a meal of classic American comfort food. On our way over to our weekly Dinin’ Hall visit, I remarked to Kish — and special guest Russell — that I had a serious hankering for a brothy noodle meal with, perhaps, some pork thrown in for good measure. 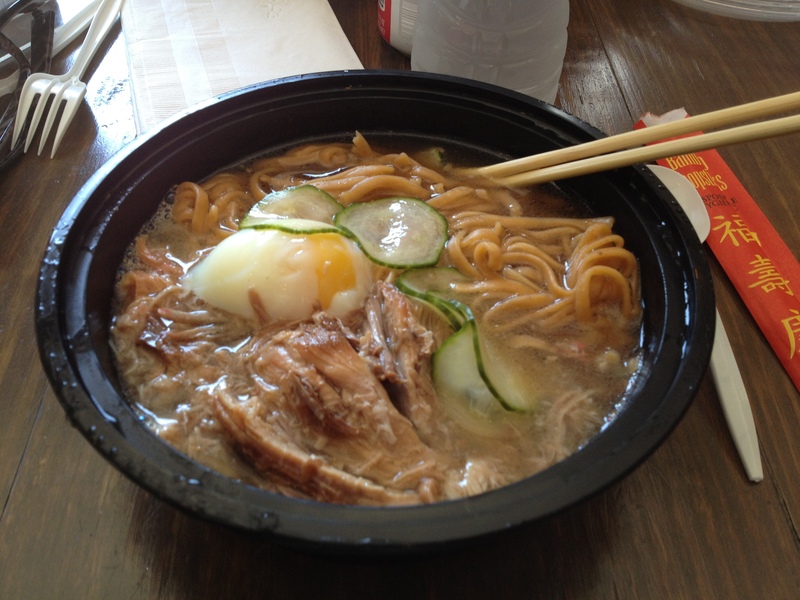 It was an inspired combination and stuffed to the gills with moist, fall-apart, infused-with-broth pulled pork — so good that I found myself thinking strange thoughts as I used chopsticks, and then a plastic soup spoon, to pound it down. Thoughts like: why can’t Dinin’ Hall provide larger plastic spoons so I can eat this even faster? And: why do they have to make these plastic bowls with the annoying little ridge ringing the bottom, which makes it difficult to get at every last, savory drop? As I write this, I recognize that I’ve raved about virtually every food item I’ve consumed at Dinin’ Hall. So be it. Their food truck vetting process must be flawless. I’m beginning to suspect that Dinin’ Hall is like Italy — you just can’t get a bad meal there. In Italy, failing to accurately predict an earthquake apparently is a crime. Six scientists and a government official were convicted in an Italian court of multiple counts of manslaughter for giving a falsely reassuring statement about a possible earthquake and were sentenced to six years in prison. 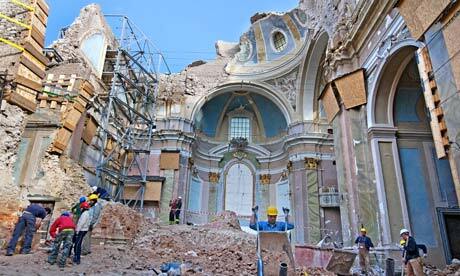 The scientists were consulted after tremors were felt in L’Aquila. At a meeting, they told officials that a major earthquake was not impossible, but it was not likely. Unfortunately for the scientists, a few days later a massive earthquake struck, killing more than 300 people and leaving the area in ruins. Prosecutors alleged that many of the casualties stayed in their homes due to the scientists’ advice and died when the buildings collapsed, whereas people who stayed outside survived the upheaval. The astonishing verdict and sentence have been greeted with richly deserved outrage. It also is an embarrassment for Italy, the home of the Renaissance and scientific pioneers like Galileo and Leonardo da Vinci. It’s hard to imagine any modern, enlightened country concluding that scientists can be criminally punished for expressing their scientific opinion — particularly when it involves predicting something as obviously unpredictable as earthquakes. What’s next for Italian prosecutors? Criminal charges for inaccurate weather forecasters? Although we sometimes might think so, America doesn’t have an exclusive franchise on nuts and their weird activities. You can find evidence of the loony element in humanity across the globe. Consider the fact that, in northern Italy, a winery makes and sells vintages with labels featuring Hitler on the label. A couple from America found the wine being sold in a grocery store in Garda, Italy and reported it to the authorities. Local prosecutors reacting to the report have opened an inquiry, but one prosecutor noted that the only possible crime that could have been committed through the sale of “Fuhrerwein” was the crime of “apologizing for fascism” — because Italy made “apologizing for fascism” a crime in 1952. So, a winery bottles and distributes what is undoubtedly their worst vintage in bottles with Hitler’s pictures, no doubt hoping that they can sell the swill to fascist sympathizers or tourists who will buy the bottles and take them home to show friends as odd curiosities. The grocery store owner, for his part, says he views the wine as some kind of historical artifact and stocks it, even though he doesn’t sell much, so that people will remember the bad things that Hitler did. Sure! The wine probably is stored in the “dictators and genocidal maniacs” aisle of the store, near the Mao Zedong popcorn and the Josef Stalin laundry detergent. And, perhaps strangest of all, we learn that Italy made apologizing for fascism a crime in 1952. Perhaps if it weren’t illegal to remember the horrors that were produced by fascist ideology, and express regret and ask forgiveness for them, Italians would have a better understanding of the idiocy and offensiveness of peddling consumer products with Hitler’s image in the first place. If you’ve been to Rome, you’ve likely seen the Trevi Fountain. It is a magnificent attraction, with its depiction of Neptune and sea horses and other sea creatures atop craggy rocks. When we visited Rome during a very hot summer some years ago, the Trevi Fountain was a delightful place to sit, enjoy the spray of the cool water, and appreciate the beauty while taking a break from sightseeing. Unfortunately, the Trevi Fountain is badly in need of repair. Earlier this year, some pieces of the 250-year-old fountain — commissioned by one of those civic-minded Popes, Clement XII — broke off. Fortunately, an Italian mineral water company, Acqua Claudia, has agreed to foot the $250,000 cost of the immediately needed restorations. Whether funding will be located for the more long-term repair work on the fountain that is desperately needed is another question. 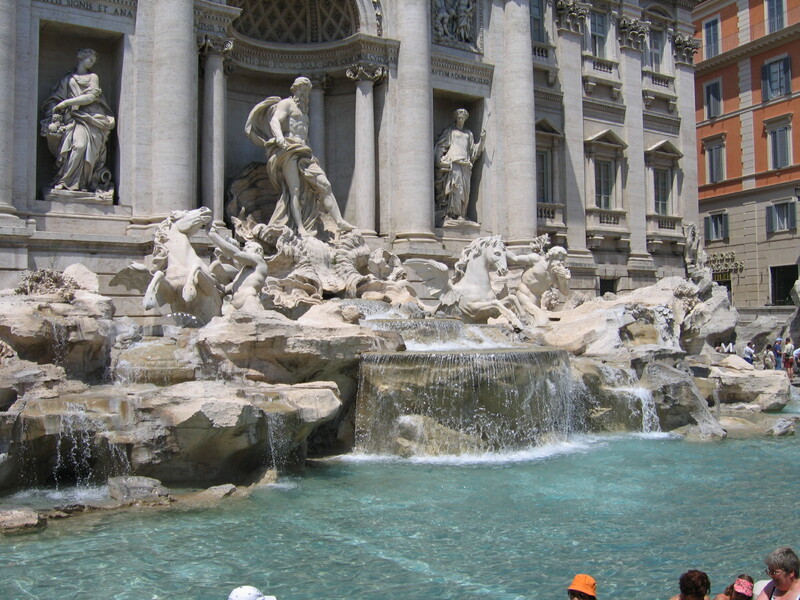 The condition of the Trevi Fountain is symptomatic of a larger problem in countries with significant cultural sites. Italy, Greece, and Spain, to name just a few, are terribly cash-strapped. 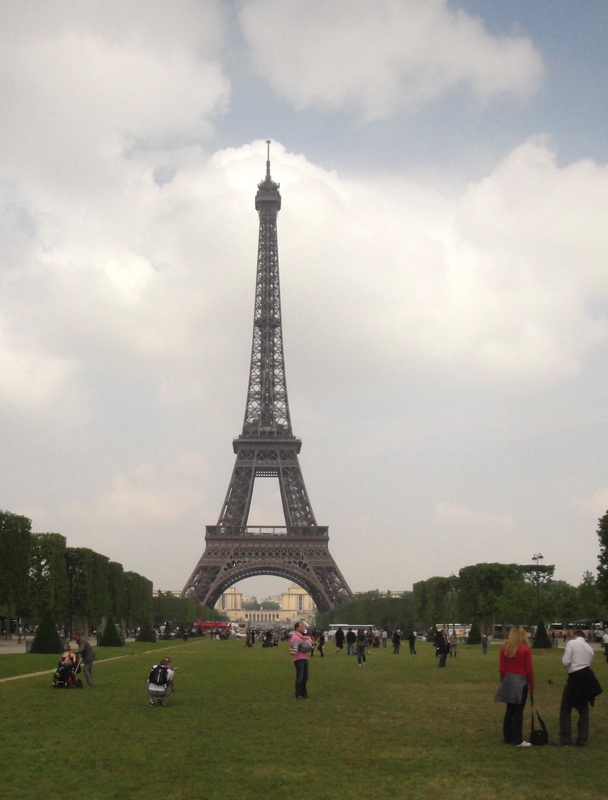 It’s hard to believe that such countries, which reap huge economic benefits from tourism, would neglect the sites that attract those tourists in the first place, but paying to maintain crumbling monuments, old buildings, fountains, and churches, is pushing budgets to the limit. I hope that other companies step up, as Acqua Claudia has, to help the Italian government maintain Italy’s many irreplaceable architectural and artistic landmarks. Generations to come should have the chance to see the Trevi Fountain in all its glory, rather than a heap of dust and rubble. Elections have occurred in Greece, France, and Italy in the past few days, and voters have cast their ballots against the austerity measures that were imposed to try to put a brake on the European debt crisis and, in Greece and France, have thrown out the governments that agreed to those measures. In France, the flamboyant Nikolas Sarkozy was replaced by a Socialist, Francois Hollande, who says he seeks an alternative to austerity and vows to increase taxes and spending. In Greece, voters deserted the parties that had dominated the political landscape for decades and splintered their support among a broad range of parties, including the disturbingly neo-Nazi “Golden Dawn”. The same trends were seen in local elections in Italy. No one should be surprised by these results. Austerity is hard; Europeans are soft. They’ve become accustomed to rich benefits, lots of vacation time, a short work week, and generous pensions that allow them to retire at an early age. The problem is that their lifestyle has been financed by debt, and now people are only willing to lend them more if they agree to actions that will bring their fiscal house in order. The fact that Greek voters and French voters don’t like the austerity doesn’t change that result. Why would you want to lend money to someone who hasn’t shown the responsibility or willpower necessary to pay you back? This likely means that the Eurozone concept will fail. Appeals for continental unity only go so far, and hardworking and thrifty German and Dutch voters aren’t going to support the unrestrained spending of the Greek and Italian and Portuguese governments forever. The Euro will end as a unified currency, the responsible northern European countries will return to their highly valued local currencies, and the southern European countries will slink back to their devalued and debased drachmas and lire, look around for new saps to loan them money with no hope of being repaid, and find there are no takers. At that point, the current days of “austerity” might begin to look pretty good, in retrospect. There’s a lesson in here somewhere for America. In America, we have the ability to just ignore the rest of the world now and then. When the news from abroad is too depressing, we turn it off and focus on more interesting American things instead, like a celebrity scandal or the new iPhone or a weirdly viral YouTube video. I think most Americans have tuned out the debt crisis in Europe. It has been going on forever. There’s no end in sight. Lots of different, faraway countries are involved. The Europeans appear to be dealing with it. So why should we care? Look, a squirrel! On Friday Standard & Poor’s cut the credit ratings for the debt issued by nine European countries. France, Europe’s second-largest economy, lost its AAA status, Italy’s debt is now rated the same as that of Kazakhstan, and Portugal’s debt is down to junk bond status. Even worse, it looks like Greece won’t be able to reach agreement with its creditors, which would mean that the latest Eurozone effort to address the Greek debt crisis would fail and Greece would be facing default and bankruptcy in March. In the modern world, the economies of countries are connected in countless ways. We sell lots of good and services to Europe; if its economies crash, those markets vanish and American businesses will suffer. American banks, mutual funds, and investors have purchased the sovereign debt of European countries and would experience huge losses in the event of defaults. And, of course, Europe’s current predicament is just a peek at America’s likely future if we don’t deal promptly with our governmental debt problems. European countries that are saddled with enormous debt are now at the mercy of ratings agencies, creditors, and faceless bureaucrats at the International Monetary Fund. So, we can be distracted if we choose — but Europe is still there, and its problems are, too. They may be our problems soon, if we don’t start paying attention.